December 9, 2013: In the tremendous buzz that has attended Narendra Modi’s emergence as the BJP’s candidate for prime minister in India’s 2014 elections, foreign policy has been almost entirely absent. Modi’s rare foreign policy statements suggest that his approach will center on economics, India’s cultural heritage, and a tough regional policy. It’s too early to tell what this is likely to mean in practice. From the policy perspective, the good news is his emphasis on enhancing India’s economic performance and ensuring that a welcome mat is out for business. The U.S. economic agenda in India has moved more slowly than other areas of U.S.-India ties, especially during the second Congress government, and a strong economic and business relationship almost invariably builds up political ties as well. Relations with Pakistan are at best a question mark from the U.S. perspective. If Modi followed his economic logic and pursued the currently stalled economic opening between the two neighbors, this could put them on a more constructive path. On the other hand, a bombing or other incident could bring out the tough side of policy. There are plenty of spoilers around who might produce such a scenario. Excellent! It was foolish of the US make so much of the Visa issue. 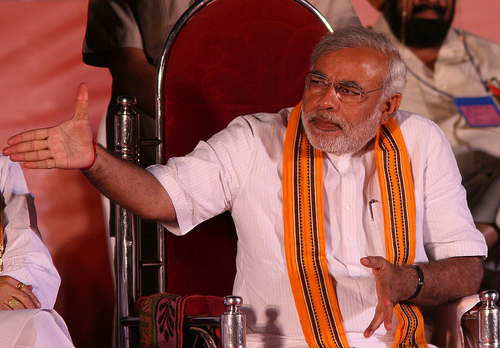 It is not clear that Modi’s exclusion falls under the US persecution of religious belief.